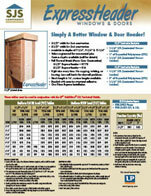 SJS Components | (260) 578-0192 | Simply A Better Window & Door Header! 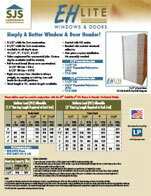 Welcome to SJS Components, manufacturer of insulated window headers and insulated door headers. Our exclusive products include the ExpressHeader and the EH Lite. Developed in 2003 to help builders cut the cost of construction and installation, the ExpressHeader and EH Lite’s one-piece express installation process benefits the builder by reducing building cost and saving construction time. The ExpressHeader and EH Lite also benefits the homeowner by increasing energy efficiency, therefore, reducing annual heating and cooling costs. Learn more about our Energy Savings.